The president Ram Baran Yadav awarded the National Films Award 2015 in an even held at the President’s place, Shital Niwas, on July 28. In the ceremony ‘Kabaddi’ was awarded the Best Movie Award (watch ‘Kabaddi’ here). Actor Dayahang Rai was awarded the Best Actor (male) award for his role in the movie ‘Sambodhan’. 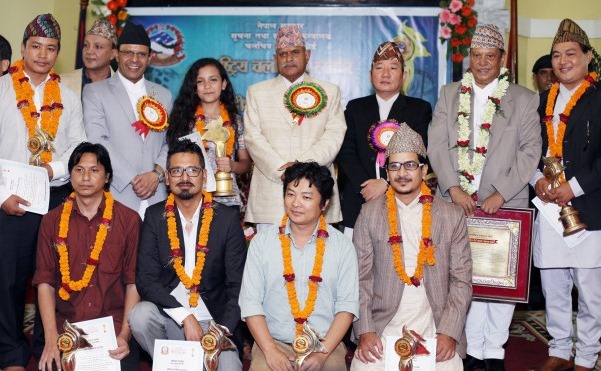 Actress Richa Sharma and Sangam Bista were awarded the Best Actress Award for their role in ‘Talakjung VS Tulke’ and ‘Love You Baba’ respectively. Nischal Basnet was awarded the best director’s award for his work in ‘Talakjung VS Tulke’. The Best Cinematographer award was awarded to Shailendra Dhoj Karki for his work in ‘Zhigrana’ and Nimesh Shrestha was awarded the Best Editor award for the same movie. The movie ‘Matan’ was awarded the best movie in ethnic films category. ‘Kabaddi’ writers Rambabu Gurung and Upendra Subba were also awarded in the ceremony. Actor, director and producer Nir Shah was awarded the Lifetime Achievement Award. Out of 87 movies released in the year 2071, 60 movies were considered for the award nomination. The jury consisted of actress Karishma Manandhar, Rajendra Shalav, Kapil Parajuli, Hemanta Budhathoki and film critic Dipendra Lama. Photo: Actress Sangam Bista with her father Gajit Bista after winning the National Films Award. This entry was posted in Artists, Event, Movie News and tagged Awards, Dayahang Rai, Kabaddi, Matan, National Film Award, Nir Shah, Nischal Basnet, Richa Sharma, Sambodhan, Sangam Bista, Talakjung Vs Tulke, Zhigrana. Bookmark the permalink. ← Why did Rekha Thapa go to Pashupati right after arrival from USA?